In the 1840s, physicists Daniel Collodon and Jacques Babinet showed that light could be directed along jets of water for fountain displays. In 1854, John Tyndall, a British physicist, demonstrated that light could travel through a curved stream of water thereby proving that a light signal could be bent. He proved this by setting up a tank of water with a pipe that ran out of one side. As water flowed from the pipe, he shone a light into the tank into the stream of water. As the water fell, an arc of light followed the water down. Alexander Graham Bell patented an optical telephone system called the photophone in 1880. His earlier invention, the telephone, proved to be more realistic however. That same year, William Wheeler invented a system of light pipes lined with a highly reflective coating that illuminated homes by using light from an electric arc lamp placed in the basement and directing the light around the home with the pipes. Doctors Roth and Reuss, of Vienna, used bent glass rods to illuminate body cavities in 1888. French engineer Henry Saint-Rene designed a system of bent glass rods for guiding light images seven years later in an early attempt at television. In 1898, American David Smith applied for a patent on a dental illuminator using a curved glass rod. In the 1920s, John Logie Baird patented the idea of using arrays of transparent rods to transmit images for television and Clarence W. Hansell did the same for facsimiles. Heinrich Lamm, however, was the first person to transmit an image through a bundle of optical fibers in 1930. It was an image of a light bulb filament. His intent was to look inside inaccessible parts of the body, but the rise of the Nazis forced Lamm, a Jew, to move to America and abandon his dream of becoming a professor of medicine. His effort to file a patent was denied because of Hansell's British patent. In 1951, Holger Moeller applied for a Danish patent on fiber-optic imaging in which he proposed cladding glass or plastic fibers with a transparent low-index material, but was denied because of Baird and Hansell's patents. Three years later, Abraham Van Heel and Harold H. Hopkins presented imaging bundles in the British journal Nature at separate times. Van Heel later produced a cladded fiber system that greatly reduced signal interference and crosstalk between fibers. Also in 1954, the "maser" was developed by Charles Townes and his colleagues at Columbia University. Maser stands for "microwave amplification by stimulated emission of radiation." The laser was introduced in 1958 as a efficient source of light. The concept was introduced by Charles Townes and Arthur Schawlow to show that masers could be made to operate in optical and infrared regions. Basically, light is reflected back and forth in an energized medium to generate amplified light as opposed to excited molecules of gas amplified to generate radio waves, as is the case with the maser. Laser stands for "light amplification by stimulated emission of radiation." A helium-neon gas laser (He-Ne) is tested in a laboratory setting. The laser tube is made from lead glass- the same glass used in neon signs. Image courtesy of J&K Lasers. In 1960, the first continuously operating helium-neon gas laser is invented and tested. That same year an operable laser was invented which used a synthetic pink ruby crystal as the medium and produced a pulse of light. In 1961, Elias Snitzer of American Optical published a theoretical description of single mode fibers whose core would be so small it could carry light with only one wave-guide mode. Snitzer was able to demonstrate a laser directed through a thin glass fiber which was sufficient for medical applications, but for communication applications the light loss became too great. Charles Kao and George Hockham, of Standard Communications Laboratories in England, published a paper in 1964 demonstrating, theoretically, that light loss in existing glass fibers could be decreased dramatically by removing impurities. In 1970, the goal of making single mode fibers with attenuation less then 20dB/km was reached by scientists at Corning Glass Works. This was achieved through doping silica glass with titanium. Also in 1970, Morton Panish and Izuo Hayashi of Bell Laboratories, along with a group from the Ioffe Physical Institute in Leningrad, demonstrated a semiconductor diode laser capable of emitting continuous waves at room temperature. Military scientists have utilized laser technology for variety of military applications. In 1973, Bell Laboratories developed a modified chemical vapor deposition process that heats chemical vapors and oxygen to form ultra-transparent glass that can be mass-produced into low-loss optical fiber. 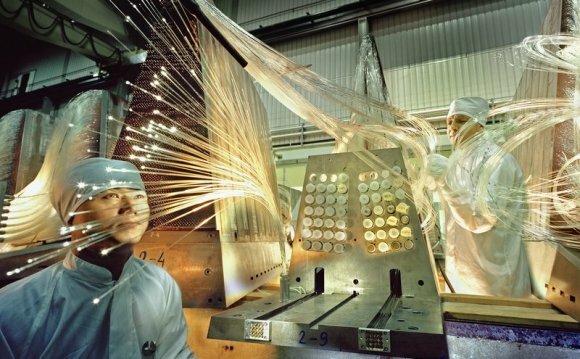 This process still remains the standard for fiber-optic cable manufacturing. The first non-experimental fiber-optic link was installed by the Dorset (UK) police in 1975. Two years later, the first live telephone traffic through fiber optics occurs in Long Beach, California. In the late 1970s and early 1980s, telephone companies began to use fibers extensively to rebuild their communications infrastructure. Sprint was founded on the first nationwide, 100 percent digital, fiber-optic network in the mid-1980s. The erbium-doped fiber amplifier, which reduced the cost of long-distance fiber systems by eliminating the need for optical-electrical-optical repeaters, was invented in 1986 by David Payne of the University of Southampton and Emmanuel Desurvire at Bell Labratories. Based on Desurvire's optimized laser amplification technology, the first transatlantic telephone cable went into operation in 1988. Where is the Ethernet cable?